In the broadest sense, Volun-Tourism represents voluntary service experiences that include travel to a destination in order to realize one’s service intentions. Kristine So was the first volunteer who came all the way from the United States to join and volunteer for the Madre de Amor hospice Foundation. She stayed from July 28 to August 12, 2009. During home visits, she joined the nurses cleaned the wound, nursing and caring the sick. She enjoyed being a volunteer because she was able to learn each patients’ feelings and the importance of giving and sharing ones time. We asked her to write about her experience at hospice. Lety’s Buko pie really is much better than Colette’s. The hospitality of the Filipino culture is unparalleled. AND… if I stayed longer I would probably end up at least twice my size from all the food! The sound of a downpour on a roof made of metal challenges any theatre special effects sound system, but will never beat a Filipina session of chimiz! There are still several grandsons out there in need of a wife! The squeeze of a hand or the sweeping motion of an abanico, perhaps brings more comfort to me than to the patient who I am with. It is an extreme blessing to be able to share one’s faith and belief in God with one another. As a student of a Catholic University, I often take this for granted. But as a citizen of a country that often believes in promoting non-denominational practices (for the respect of the multitude of existing beliefs), I miss this privilege. Being able to pray together and care for another through our faith has been a truly wholesome experience. Meeting the patients AND their families prior to a death is both unnerving and calming. It is unnerving in the sense that you see how much love is bestowed upon the patient and how painful it is for the family once the patient passes away. But it is calming to see that the families, or at least the ones of whose family member’s wake we attended, are comforted to see their loved one finally at peace. Everyone has his or her own way of coping with pain and suffering. One of the first ways of finding your own way is to accept the ways of others – accept openly and without judgment. The arms of the Filipino race are large and the embrace is warm. My immediate family alone has been most loving and has supported me through every step of this experience. For that in itself, I am endlessly grateful. The lessons mentioned do not seem to do my experience justice. But I cannot seem to find the right words. As a compromise, please accept the following letter I addressed to Tita Pretzel. I composed the following over the course of my stay and have lengthened it slightly to better cover what you may be looking for in an “appropriate response.” I apologize for the length, feel free to read as little or as much of it as you would like. 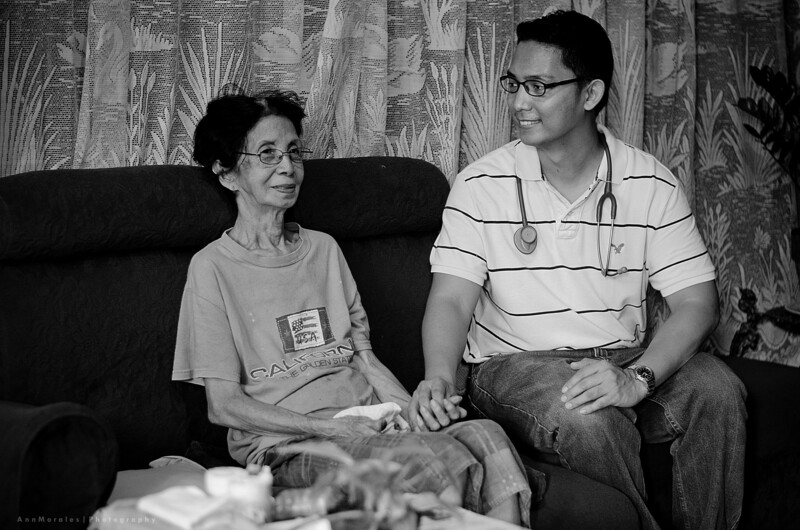 On my first day out visiting patients, you asked me why I chose to volunteer. For every patient, you have told them that I am on vacation and that I just wanted to ‘tag along’ for the experience – not those exact words, but something along those lines. Over the past three weeks, I never gave you a substantial answer to your question; when you asked, I’m pretty sure all I did was to shrug my shoulders. So, Tita, here is my answer to your question (perhaps a little longer and wordy than you were looking for, but an answer nonetheless). I am well aware that I was born into a very fortunate situation. My family is by no means wealthy. Yes, both my parents are doctors. Yes, the work is steady. And yes, that does have its perks, but during this tough economic state, what money is made can only be spread so far. But then I realize that the ability to support our family and the level of education both my brother and I are receiving, highlight how fortunate I truly am. I do not say this to flaunt or taunt, but rather, to supplement my response. For the longest time I have volunteered in hospitals, but when I was younger, it was almost a default activity as my parents always had to work late, so what better way to spend my time than help around the hospital – this would, after all, keep me close to them, and supervised! It was like a convenient and accessible form of babysitting! As I grew older, my desire to pursue medicine increased and working with the sick during my volunteer placements became yet another default action. So yes, this short stay with you is for the “experience.” I figure that a physician should be prepared for it all, right? If I can’t handle the things I encounter on our outings, then perhaps Medicine isn’t for me. In a way, these past few weeks have been a way to test my own stamina, both the physical, but more importantly, the emotional. And while I have constantly evaluated myself, only you and the patients can truly judge my performance; only you can judge whether I have expressed enough genuine concern and compassion for the patients and their families. But all that is only one component. Perhaps the main reason I came here of all places is because it hits so close to home. The Philippines will always be referred to as “home” to my parents. Most of my family still lives here. When I was ten, I visited for the first time and, amidst the hustle and bustle of my grandfather’s funeral and my grandmother’s surgery (for colon cancer), I met much of my extended family. Through them and through their friends, I was exposed to what “poverty” truly entails. Sure, I was born outside of Boston. I have been through New York City streets. I’ve seen beggars and the homeless all over Chicago, LA, DC, etc., but again, this place will always hit closer to home. My parents grew up in tough situations, but before them, my grandparents had it worse. And since my first visit to the Philippines, I can’t help but thinking that all else considered, I could have been born in the place of my parents, or even those I have sat with over the last three weeks. Instead, I was born into considerable comfort. And my parents have always made sure that I am constantly aware of this fact. I think it’s a common Asian lesson – or at least most of my Asian friends and classmates who now currently reside in the US have been taught – to be grateful of our blessings and that we must always work to surpass the success of our parents. Looking to my mother’s side for example: my Lolo’s family worked so hard so that he would be able to attend college. He was the only child to do so in his family. From there, he worked even harder so that my mother could attend medical school. And subsequently, my mother worked tirelessly to succeed, move to the US with my father, and ultimately practice medicine abroad. For foreign medical graduates, this feat is monumental. So now, as they say, “the buck stops here”… with me. I must now move forward, work even harder, and surpass my parents’ success, so that I, too, can support my children and my parents. But why volunteer? Surely I can just study hard, get good grades, and pursue medicine in that fashion. Many of my classmates and those before me have done so. There has never been one day in my life where I was in want of food or clothing. Not one day where I was asked to make a sacrifice too great. I have been blessed with a loving and supportive family (as you can probably tell from my Tito who, to my good fortunate, agreed to volunteer beside me when he could have otherwise declined!) and amazing friends. As I started with above, I have been born into a very fortunate situation, so I firmly believe in the statement above. It is my responsibility to give back to those who have much less. And when I take the time to consider what the field of medicine encompasses, I often do not dwell on the science side of things. Yes, knowing the science is crucial, but realizing that a doctor’s role is to be truly responsible for the well being of another, is paramount. It is because of this, that I feel that volunteering is so essential – especially for a student in my shoes. For several of the volunteers, this activity is a great way to spend retirement. Or, as it is stated on the foundation website, for some, having survived an illness themselves, they feel as though they have been called to service. But I think both the need to serve and the action thereof should be recognized and acted upon at an early age. And for those planning to pursue medicine, I believe hospice work teaches some of the best lessons. Perhaps this is due to the atmosphere in which I have lived and the education which I have received. At home, we have ever advancing technology. To be admitted to a good medical school, you must almost always conduct lab research. We are taught to look for answers and solutions – tangible things we can do to improve our situations – or for doctors, the situations of their patients. But with hospice work, the scientific side of things is kept to the minimum: to understand the ailment and to be aware of ways to alleviate pain encompasses the bulk. It is this inability to physically fix things that was one of the hardest parts of the last three weeks. As was reviewed during my orientation, I did often feel useless. I had no ointment for bedsores. There weren’t any of the morphine drips that I often see at home. I wasn’t even here long enough to keep up with stories shared during visits. But I soon found my niche – for some it was holding a patient’s hand, playing with the children of the house, or, in some cases, bashfully being offered to meet or marry a Lola’s grandson. In retrospect, I realize that hospice challenged me to reach out and make a connection. Unlike school-required activities, where this is an assigned task or I am clearly introduced as student with a set duty, here, I had to relate to the patients in my own way. And after awhile, I realized that there is simply a universal language that must be practiced – that of patience, genuine respect, and sincere compassion for one another. I found that once this was set in motion, I was able to see the “healing” amidst the dying. In preparation for these last three weeks, what I feared most was not how severe the cases would be, but rather, being witness to cases that, at home, would otherwise be treated – often regardless of financial status. These would be the cases that would highlight my blessings, but would also cause me to regret that I cannot do more. But someone once told me that, “the greatest gift one can give to another, is one’s time.” Joining you has been an amazing experience, even though I do not believe I have made much of a difference. But, at least for now, this “gift of time” is the best I can do. I hope to become a doctor someday – perhaps I will have the chance to return and provide the medical services that will be deemed more useful. When I return home, I may be able to raise funds to give to the foundation, but all that is either further in the future, or as far as the money goes, very lacking in terms of human connection. I come from a sterile world. Hospitals are gleaming white. And I, even as an ER volunteer with duties as simple as delivering water and changing beddings, must wear gloves for almost everything. It is in this sterile world where the comfort of a supportive hand is masked by a rubber glove. The answers to a patient’s fears and concerns are clouded by a physician’s medical jargon. At home I volunteer at fundraisers. I donate money to the church. I listen to the stories my family tells me about their lives. And all the while I am separated from the “real thing.” I do not see the people to whom funds are donated. Pictures are the small windows into the situations in which my family grew up. In comparison to many of the patients, I live in a “safe haven,” so to speak. I will not attempt to fool myself, or anyone else. When we visit patients, yes, there is definitely suffering. There is sadness, though often masked by smiles and laughter. But there is also family. Perhaps my demeanor is not strong. Perhaps if I stayed longer, the accumulating number of deaths would slowly chip away at my core. But I can’t help but to conclude that I am able to handle these visits because I am able to see that the patients are supported. There was not one patient that I met who did not have at least one person who cared deeply for them, and even more impressive, was present during our visit. At home, I come in contact with patients whose family is not there to support them. It’s not that they don’t have family, but rather, their family does not have the time to be with their loved one during trying times. It is the familial support that our patients seem to have that presents a double edged sword: it not only provides me momentary comfort – something I can focus on aside from the severity of their respective conditions – but it reinforces my gratefulness of all with which I have been blessed. So now, nine days, 30 patients, approximately 55 visits, and 4 departed later, I answer your question. Why volunteer? Because I love my family – the one composed of those with whom I share a direct bloodline, and of those with whom I share an ancestry. And I have always been taught that no matter what the situation, family comes first. So here I am with my family. And, as it always seems to go, no matter how much I try to give back to my family, I am always the one who comes out with more. Over the past three weeks, I have learned more than I could have ever expected. I have truly been blessed with much more than I deserve. I came to the Philippines to be with my family. I “volunteer” because I can’t think of a better way to spend my time. So, Tita Pretzel, there’s my answer to your question. If it hasn’t been satisfying enough, please feel free to ask me anything you’d like. Again, I apologize for the length. Like I said, I’m a science major, not an English major. And like my time, it’s the best I can do.